All of a sudden I want a red coat. I love its boldness. The way it stands out. How it defies winter's bleakness. Plus, Gwyneth has been rocking one--hers (by Rag & Bone) is more like a jacket, but same concept. Need further inspiration? Check out these glam pics below as well as several compelling options (most of them on sale!) from a classic J.Crew, a military-inspired Asos and a moto-inspired one, a spot-on Whistles, and a double breasted blazer-like Dorothy Perkins. i can't rock red - but if i could, i would! I'min love too with red coat, and I wrote a post about it!!! 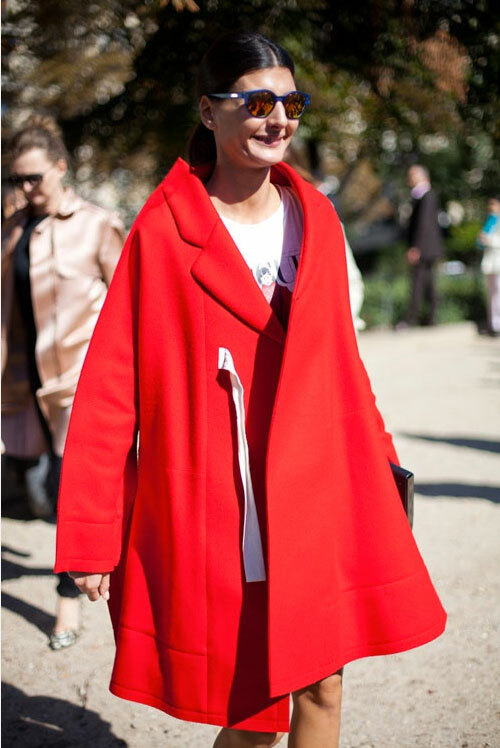 do you know what that coat Giovanna Battaglia is wearing? it is sublime! Giovanna Battaglia's jacket looks like it's by Comme des Garcons or Margiela... but I will look into it.